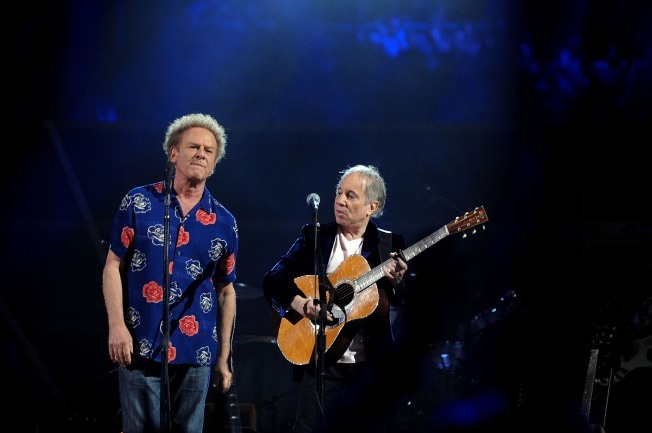 Simon & Garfunkel perform onstage at the 25th Anniversary Rock & Roll Hall of Fame Concert at Madison Square Garden on October 29, 2009. Legendary folk duo Simon & Garfunkel will reunite for Jazz Fest in New Orleans later this year, the Times-Picayune reports. The "Homeward Bound" and "Mrs. Robinson" singers have agreed to headline the Acura Stage on Saturday, April 24. It is their only announced American appearance. After breaking up in the 1970s following the release of hit “Bridge Over Troubled Water,” the duo have each carved out solo careers. They have launched reunion tours and comeback shows over the ensuing years, with a New York City Central Park concert in 1981drawing a crowd of 500,000 fans. The duo last last joined each other onstage in February in New York. Paul Simon has performed Jazz Fest before, but it will be Art Garfunkel’s first time at the Fair Grounds, according to the Times-Picayune. Other announced performers at the two-weekend event include Lionel Richie, My Morning Jacket, Dr. John, Darius Rucker, Pearl Jam, Aretha Franklin, Van Morrison, B.B. King, the Neville Brothers and Widespread Panic.